The W Club registration period is now open for everyone! Just like last year, the 6th of February is the day that the W Club registration period opens for everyone. If you want to be a member of this exclusive Integrity Toys club, you have to register until the 3rd of March. Below, you can find more information about the W Club, the upgrade dolls and more. Or you can read about it all in the registration brochure here. Or go ahead and register here. The W Club is the Official Collectors’ Club for all Integrity Toys collectible dolls, including their lines of Fashion Royalty®, NU. Face™, Poppy Parker™, East 59th™, The Monarchs Homme™ and other. The new club year will be packed with exclusive perks, new dolls, special offers, priority service and more. Should you have any questions at any time, please contact the Club Liaisons at wclub@integritytoys.com. The W Club is an online based club and requires online registration plus a valid email address to receive information and special offers. it is run separately but in conjunction with Integrity Toys and acts as the collectors’ voice at the table for the company. *Details and instructions for this coupon will be sent to 2019 W Club Members at a later date, including that a one coupon limit will be allowed per order. Important exclusion: Coupons cannot be used to purchase additional W Club memberships. Any memberships bought with coupons will be voided, as the 2019 Club year does not officially begin until after registration ends. The base membership for 2019 is still $50. All W Club members in good standing receive perks and privileges throughout the Club year, including first-to-know information, access to exclusive W Club merchandise (including the guaranteed opportunity to purchase W Club exclusive dolls), lottery chances for other exclusive dolls, contests, special offers, VIP customer service, the special offers listed on the preceding pages and more. You may upgrade your membership by choosing 1, 2 or all 3 upgrade dolls. * Upgrading your membership only gives you additional dolls, it does not affect any other perks. All members in good standing receive full access to perks. Upgrade dolls are produced based on the specific quantity ordered during registration, the dolls will arrive in approximately Summer 2019 and the balance of the payment will be due then. You can buy as many memberships as you want and for every membership, you can upgrade each with a Fashion Royalty Vanessa Perrin, NU. Face Lukas Maverick and/or Poppy Parker doll (up to 3 total, one of each item, for every one membership that you buy). *Note: the Upgrade dolls ARE NOT the W Club exclusives for the year. You will still get 5 more exclusive dolls that you can pre-order later in the year. BASE MEMBERSHIP: $50; Includes the opportunity to purchase at least five exclusive dolls throughout the year- including two exclusive Fashion Royalty dolls (which may include NU. Face), two exclusive Poppy Parker dolls, and one additional exclusive surprise doll- a $25 coupon and a variety of perks, privileges, special opportunities and offers throughout the year, from lines such as The Monarchs Homme collection. Adding the Upgrade “French Kiss” Vanessa Perrin Fashion Royalty doll to your base membership will have an additional $25 deposit due now and $110 (total of $135 US) plus shipping, handling and tax will be billed approximately in Summer 2019, when the doll is scheduled to ship. Adding the Upgrade “Level of Suspense” Lukas Maverick figure from the NU. Face Collection (as voted on by 2018 members!) to your base membership will have an additional $25 deposit due now and $110 (total of $135 US) plus shipping, handling and tax will be billed approximately in Summer 2019, when the doll is scheduled to ship. 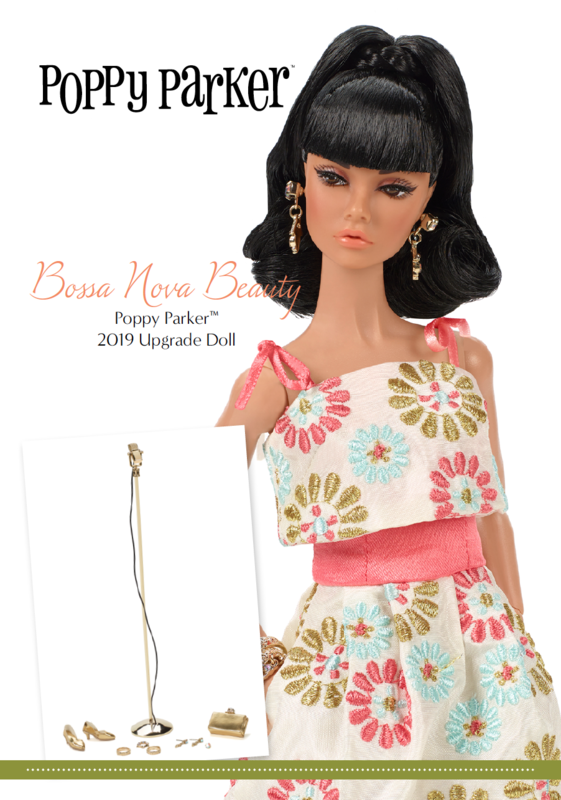 Adding the Upgrade “Bossa Nova Beauty” Poppy Parker doll to your base membership will have an additional $25 deposit due now and $110 (total of $135 US) plus shipping, handling and tax will be billed approximately in Summer 2019, when the doll is scheduled to ship. Vanessa Perrin is a 12.5-inch articulated vinyl doll with flowing, fully rooted hair and hand-applied eyelashes. She comes with a multilayered outfit that includes a plaid overdress with a separate slip dress underneath, high-heel ankle boots, socks, hoop earrings, a “box” purse, a golden ring and an abstract cuff bracelet! Doll stand and certificate of authenticity included. For adult collectors ages 15 and up. This doll will have a non-refundable deposit due immediately, with a balance due at shipping time, approximately in Summer 2019. A 1.0 Vanessa doll is always good news - and in a tan skin-tone, now named “sun-kissed”, even better. Why do we get all that tan variables is beyond me - it definitely has to do with the haphazard way they make the skin tones in the Chinese doll factory IT uses, without a proper recipe with colour percentages, just mixing colours trying to match the shade. Not very good for replacement bodies in the future - just try to find a tan homme body and tell me about it. The screening screams Going Public Eugenia - in fact, when I first saw the first photo of the email, I thought she was Eugenia, not Vanessa. Beautiful accessories but I am not that crazy about the fashion. Jesse Ayala designed this one. Lukas Maverick is a 12.5-inch articulated vinyl male figure featuring fully rooted hair. He is wearing a custom designed detailed faux-leather jacket, over a classic white shirt and convertible pants (each section can be detached to create additional looks). Faux-suede sneakers, eyeglasses, bag, double wallet chain with snake pendant detail, one earring, figure stand and certificate of authenticity are also included. For adult collectors ages 15 and up. This doll will have a non-refundable deposit due immediately, with a balance due at shipping time, approximately in Summer 2019. First of all, dear Integrity Toys, please stop calling male dolls “figures”. They are DOLLS. Even the G.I. Joe figures are actual dolls that are named figures to placate parents buying them for their little boys. This is so backwards thinking, especially in this day and age. So please stop it. It does not fit with what Integrity Toys represents as a doll company. Lukas is his usual gorgeous self but looks uncomfortably a lot like his first apperance, Raw Appeal, from the 2009 convention, minus the eyeliner. The outfit is not that impressive either. Compare it with Bellamy Blue from last year’s Industry collection and you can see why. Those convertible pants have got to stop - the Violaine ones were more than enough. So last year. Jesse, I was expecting so much more from this one. Poppy Parker is a 12-inch fully articulated fashion doll with fully rooted hair and hand-applied eyelashes. She comes dressed in an elaborately embroidered gown and includes jewelry, golden kitten heels, a purse and a newly designed standup microphone. A special themed package was created just for this collection. Doll stand and certificate of authenticity included. For adult collectors ages 15 and up. This doll will have a non-refundable deposit due immediately, with a balance due at shipping time, approximately in Summer 2019. David Buttry designed this one within the concept of this year’s Poppy spy theme, which story is taking place in Brazil. I love the print but not much more from this one. If you described her to me without any photos, I would have said “what a lovely doll”, but the execution seems slightly off to me. Remember that all dolls shown are prototypes only, the final production may vary slightly. No registrations will be accepted after March 3rd, 2019 at Noon Eastern Time (New York time). No exceptions. For how long is my 2019 Club membership valid? Memberships are valid until the latter of January 1, 2020 or when the 2020 Club membership registration period begins. As a member, will I be guaranteed every exclusive item from the Club? Every member in good standing will be guaranteed the right to purchase at least 5 exclusive dolls, which will be offered at various times throughout the Club year, including the 2 Fashion Royalty exclusive dolls (which may include NU. Face), 2 exclusive Poppy Parker dolls, and 1 additional exclusive doll during 2019. Members that added upgrade dolls during registration are guaranteed those upgrade doll(s), as well. There will be other limited items which will be available by lottery or first-come, first served opportunities. Please note that membership in the W Club does not guarantee access to Integrity Toys’ non-Club exclusive dolls and accessories. None of the dolls available through the Integrity Toys’ authorised dealers can be purchased through the W Club and are not W Club exclusive items. How many 2019 Club memberships can I purchase? IT is not restricting the number of memberships by collector or household. However, memberships are non-transferable and cannot be shared. I live outside of the US. May I still become a member? Absolutely! Membership is available to residents of all countries worldwide. Please note that all news releases and information will be released in English only. I would like the Club information sent to me via regular mail; can IT do that? This is an online only Club and all members must have access to a valid email address. What forms of payment does IT accept? All payments are processed through Integrity Toys’ online shopping cart system. They accept Credit Cards (Visa, MasterCard, American Express and Discover). They also accept PayPal. If you don’t have a PayPal account or a credit card, they suggest that you get a prepaid credit card, as it makes it easier for you to take advantage of their many offers. Can you tell me more about the purchasing of exclusive W Club dolls? 2019 W Club members are guaranteed the right to purchase the exclusive W Club doll(s) from 2019 only (these dolls are separate from and in addition to the upgrade dolls that you can purchase at registration). The number of W Club exclusive doll(s) produced is based on the number of pre-orders paid. 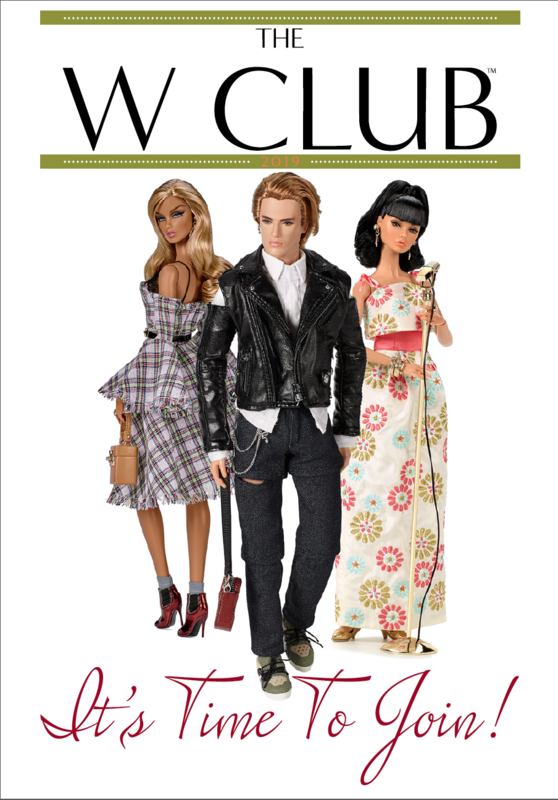 If you do not pre-order the Club doll(s) by the designated cut-off date (there is usually about a week-long ordering window), you forfeit your right to purchase that Club doll through the W Club. Also, Club doll(s) from previous years are NOT available to 2019 members- Club dolls are only available during that specific membership year. Can you explain more about the Club coupon? Each W Club membership that you purchase will automatically add a special $25 coupon to your IT Direct Coupon Wallet that can be used towards ANY IT Direct shopping cart purchase of $99 or more online only during the 2019 W Club year! As long as your order is above $99 before shipping and tax, you can apply your coupon towards any order of your choice! Full details and instructions for the $25 coupon will be sent to 2019 W Club Members at a later date, including that a one coupon limit will be allowed per order. Important exclusion: Coupons cannot be used to purchase additional memberships. Any memberships bought with coupons will be voided, as the 2019 Club year does not officially begin until after registration ends. When will I be able to log into the W Club forum? Once your membership has been processed, you will be emailed the “Welcome to the 2019 W Club” notice. This notice includes information on how to register and be approved for the members-only forum, contact emails, email information and more. Due to the number of registrations that we expect to be receiving at this time, it can take up to a week or more for the welcome notice to be sent out and we appreciate your patience until you are sent the notice. to view the rules document. So, are you joining this year? I know I will! Remember, the deadline is March 3rd, 2019! All photos and information contained herein is copyrighted Integrity Toys, Inc. and Intercap Merchant Partners, LLC 2019 and may not be reprinted or disseminated without express written permission. 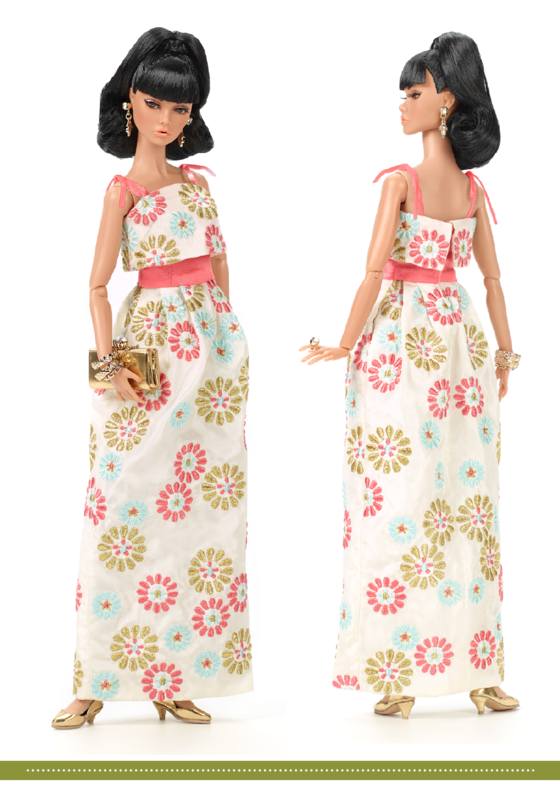 FASHION ROYALTY, POPPY PARKER, NU. FACE, EAST 59TH, THE INDUSTRY and all other character marks followed by ™ or ® are trademarks of Integrity Toys, Inc. Chesapeake City MD USA 21915. All rights reserved. The W Club is a trademark of Intercap Merchant Partners, LLC. All rights reserved. Doll Photography by Tony Pettinato. Layouts and graphics by Alain Tremblay, Marketing.